Chef Tu David Phu, ready to roll. Last month, Oakland’s Tu David Phu held his final ĂN: A Vietnamese Dining Experience pop-up. Now, he’s switching gears and launching Chef’s Hawker Center, a nationwide pop-up series celebrating Asian ingredients, techniques, and culture in collaboration with Cochon555, a "nose-to-tail culinary event dedicated to supporting family farmers." This idea has been on Phu’s mind for years, sparked by conversations with fellow chefs who all agree that the best food they’ve ever had was while traveling abroad, eating with their hands at street stalls. Chef’s Hawker Centre, spelled with a nod to hawker mecca Singapore, is an attempt to pay homage to that food culture in a fine dining setting. In ways, it’s also Phu’s response to what he sees as food bigotry. Each dinner will pair two chefs — sometimes, Phu will be one of them — cooking a nine-course feast at a featured chef’s restaurant for $90-$100. That includes cocktail and wine pairings, and proceeds will go to Cochon555's charity, Piggy Bank, a sanctuary for heritage breed pigs. They’ll also follow an overall theme, such as Asian barbecue, omakase, or Filipino heritage. The first two events take place in San Francisco, followed by two dinners at Oakland’s alaMar Kitchen (100 Grand Ave.) on Thursday, Jan. 25, and Friday, Jan. 26. The first is a collaboration with alaMar chef Nelson German, who is Japanese-trained, exploring the melting-pot culture of Oakland. 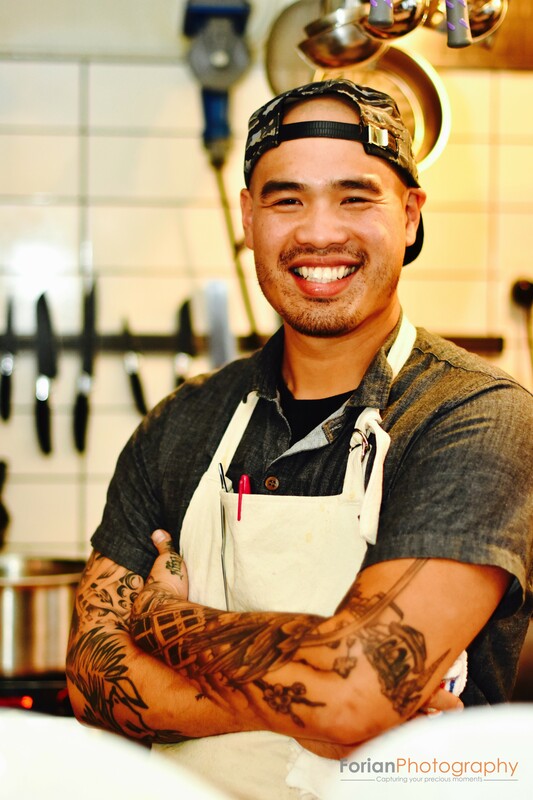 The second Oakland event features San Francisco chefs Shawn Naputi (Prubechu, formerly Foreign Cinema) and Chris Yang (Aina), who are from Guam and Hawaii, respectively. They’ll cook their interpretations of island cuisine. Through the series, the Top Chef contestant hopes diners see similarities in the food and stories presented to them with their own backgrounds. “That’s a great way to bring people of different colors together,” he said. After cooking in the Bay Area, Phu will travel down to Southern California, followed by events in Oregon, Washington, Rhode Island, New York, and more. In late June, he’ll organize a Chef’s Hawker Centre street festival with the Asian Art Museum in San Francisco, and if it goes well, it could become an annual thing. For now, the pop-up series doesn’t have a finite lifespan. As for his Vietnamese pop-up ĂN, Phu isn’t so sure when or if it’ll return. Editor's note: A former version of this story only named Shawn Naputi's work at Foreign Cinema, not his current restaurant Prubechu.